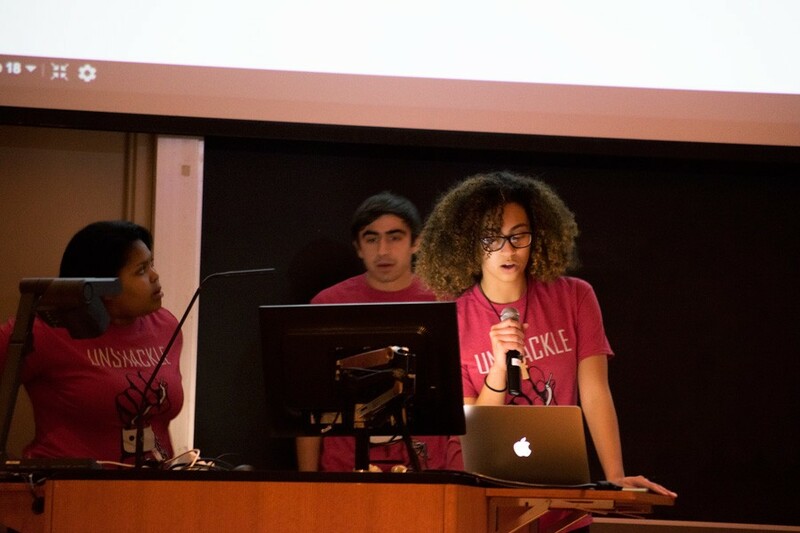 Students present on Unshackle NU, a new divestment campaign aimed at private prison companies. The campaign calls on the University to divest from companies G4S, Corrections Corporation of America and The GEO Group, which the campaign says NU has holdings in. Students introduced a new private prison divestment campaign Wednesday night as part of an initiative to incite structural change to Northwestern’s investments. The campaign, Unshackle NU, calls for the University to divest specifically from G4S, Corrections Corporation of America and The GEO Group, in addition to a longer list of companies the campaign says the University invests in that relate to the prison-industrial complex. Unshackle NU members described the complex as the network of political and corporate interests working to utilize rapidly expanding imprisonment, incarceration and detention, surveillance and policing in the U.S. to advance an oppressive social and economic agenda on people of color. Unshackle NU members broke down four pillars they said make up the prison-industrial complex: disenfranchisement in order to oppress communities of colors and create a racial caste system, the “school-to-prison pipeline” which sustains that system, targeting queer and transgender people of color and manifestation of the complex within immigration detention centers. Unshackle NU hosted the event to discuss how they say NU is invested in private prisons and the reasoning behind the divestment campaign. Some came to the session with prior knowledge about the topic, such as Weinberg freshman Christian Reyes. “Having friends who have family members that come from areas that are impacted by (the prison-industrial complex), I’ve learned a lot from them and want to get more involved,” Reyes said. On Wednesday, the University’s Chief Investment Officer William McLean told The Daily in an email that he did not believe the University had investments in private prison companies. Unshackle NU’s campaign, however, is targeting more than just private prison companies, its members said, and is looking for the University to divest from corporations that they say contribute to the prison-industrial complex, namely G4S, CCA and GEO. “(McLean) said to The Daily that he doesn’t invest in private prisons, but G4S is the leading private security company in the world and we know that we’re invested in them,” Hanna said. “And that’s the bigger issue: Students don’t even know what (NU is) invested in. There’s no transparency and we have to meet with these people so that they can tell us if we are. Snaps and applause filled the room as Unshackle NU concluded the two-hour presentation and welcomed students to stay for a Q&A session.